In 2015, the National Highway Transportation and Safety Administration estimated that there were 6.3 million motor vehicle collisions reported to police departments across the country. Contrast that to the 10 million trips Uber completes per day (according to its website) and it becomes clear that it is inevitable that Uber drivers and passengers will fall victim to motor vehicle collisions. The insurance company that insures the Uber driver (personal policy covering his/her everyday driving), includes all of the familiar faces such as Allstate, Geico, Erie, State Farm, Farmers, MAIF, etc? It depends on the policy (the contract). Most insurance carriers have excluded ride sharing (Uber), but offer a ride share rider that provides coverage. Unfortunately, in my experience, few Uber drivers notify their personal insurance carrier that they are participating in a ride share program, thus they may not be covered. How would the carrier know? There are many ways, but the most common, in my experience, is the Uber sticker. The property damage adjuster simply takes a photo of the property damage showing the sticker. The Pinder Plotkin Legal Team recently had a case where a client had signed up for Uber, but had not given a ride and the insurance carrier initially denied coverage because the Uber sticker was photographed in the glove box. $1 million of liability coverage per incident. From acceptance to conclusion of a trip. Uber holds a commercial insurance policy with $1 million of coverage that is primary to any personal auto coverage. This is only for personal auto coverage and not commercial auto coverage. Some drivers (UberBLACK, UberSUV, and UberTAXI) are separately commercially licensed and insured pursuant to local and state requirements. $1 million of UM/UIM bodily injury coverage per incident. From acceptance to conclusion of a trip. Protects against hit and run and under/uninsured drivers. Contingent comprehensive and collision insurance. From acceptance to conclusion of a trip. MAYBE. If an Uber driver’s personal policy includes comprehensive and collision insurance, then it is covered by Uber’s policy if the damage occurs during a trip. $1,000 deductible. No fault coverage (Personal Injury Protection) is provided in certain states – $2,500 in Maryland. If the Uber driver or its passenger’s personal PIP is in excess of $2,500 ($5,000 or $10,000), then additional PIP coverage may be available. $50,000/$100,000/$25,000 of coverage in-between trips. This is a grey area, where personal coverage should provide coverage, but if it does not, the Uber policy provides liability for bodily injury up to $50,000/individual/accident with a total of $100,000/accident and up to $25,000 for property damage. Uber exceeds the Maryland state minimum of $30,000/$60,000/$15,000. The Uber provides coverage for ride share “driver-partners” while logged onto the Uber app. Note, the coverage changes based on the status of the driver. App on: While the driver is waiting for a request: Online with Uber before the driver accepts a request, then the Uber driver is covered by the Uber insurance policy for liability to a third party (passenger in its vehicle or the driver/passengers of another vehicle) if the Uber driver is at fault for the collision (see $50,000/$100,000/$25,000 above). If another person is at fault, the Uber driver (and its passengers) may make a claim against the other party’s insurance. If the Uber driver had a personal policy it may provide additional coverage if there was a ride share rider. App on: While the driver is waiting for a request: Uber driver is on its way to pick up a passenger, but before he/she get into the Uber driver’s vehicle, the Uber policy covers: (1) liability to a third-party; (2) Uninsured Motorist / Underinsured Motorist (UM/UIM) coverage – injuries caused by an underinsured or uninsured third-party; and (3) collision and comprehensive coverage if the Uber driver has a personal policy carrying the same. Most people refer to collision and comprehensive coverage as having “full insurance.” That is not always the case and it is important to provide your lawyer a copy of your insurance policy. On trip: While a rider is in your car: Uber driver is transporting a passenger. When a rider is in an Uber, the Uber policy covers: (1) liability to a third-party; (2) Uninsured Motorist / Underinsured Motorist (UM/UIM) – injuries caused by an underinsured or uninsured third-party; and (3) collision and comprehensive coverage if the Uber driver has a personal policy carrying the same. It is essentially the same as request accepted with the addition of passengers. Offline: When driving vehicle for personal use: The Uber driver is not covered by Uber’s insurance policy – such as Allstate, Geico, Erie, State Farm, Farmers, MAIF, etc? 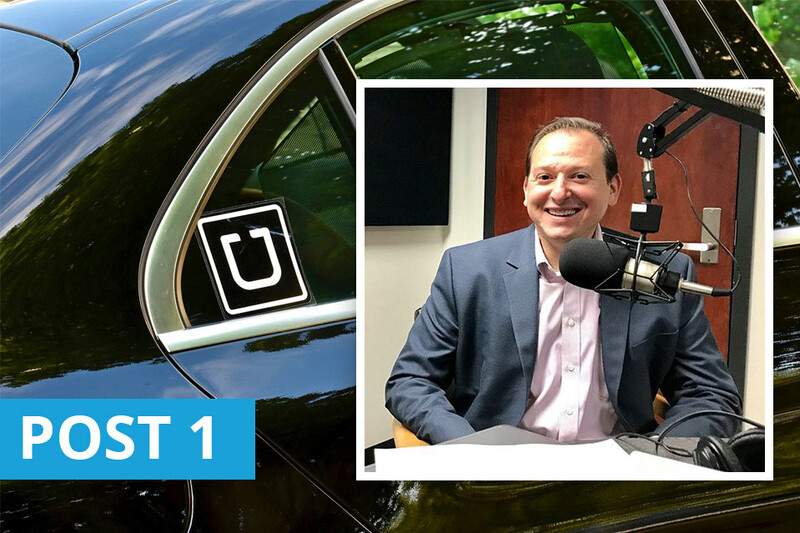 In November 2017, Jason A. Plotkin presented a National Continuing Legal Education course on Uber & Lyft Litigation to attorneys and other legal professionals located throughout the country. The course was designed to teach other lawyers how to handle the unique nuances of accidents involving Uber, Lyft and other ridesharing companies. If you or someone you love has been injured, or even died, as the result of an Uber or Lyft car accident, the Pinder Plotkin Legal Team is on your side. Our attorneys have years of experience representing clients in auto accident cases and for other personal injury claims, and we’re prepared to fight aggressively in court to defend your rights. We always offer free initial consultations for personal injury cases, so there’s no risk in speaking with us and receiving an honest and informed evaluation of your case. Call us at (410) 661-9440 or fill out our online contact form to speak with an attorney and discuss your legal options. The information provided in this website is provided for informational purposes only, and should not be construed as legal advice on any subject. The information contained in this blog is also subject to change and should not be relied upon. Such a good post, I really enjoyed reading it.